Efforts were stopped by Maduro, who blocked the highway and had troops in place. A convoy carrying American humanitarian aid arrived at the Colombia-Venezuela border on Thursday as the U.S. and Venezuela's interim president Juan Guaido pressure President Nicolas Maduro to let the aid in and leave power. 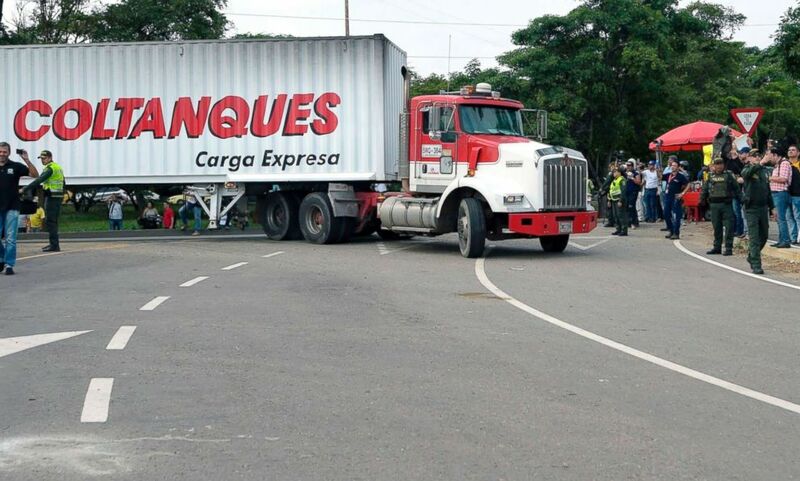 Nine trucks in total drove into the border city Cucuta, but it will remain on the Colombia side for the time being after Maduro used a tanker, two shipping containers and some fencing to block the highway on the Tienditas Bridge and deployed troops to guard them. 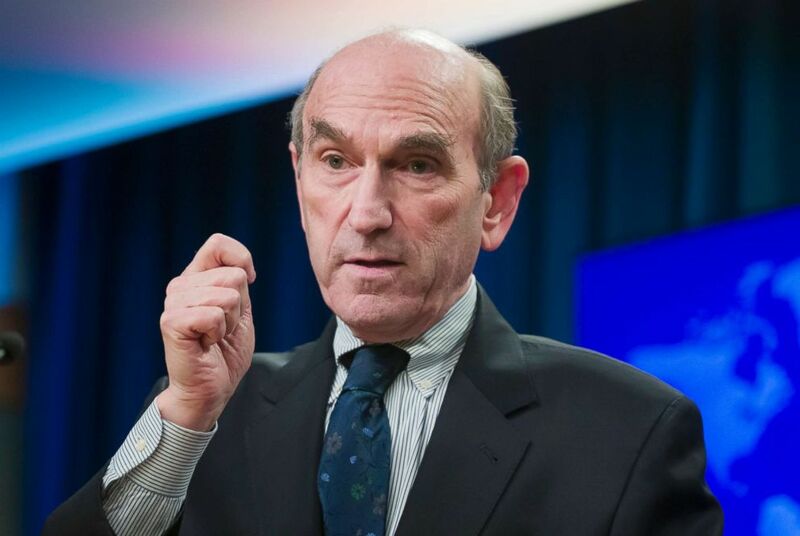 That aid, which included food and nutritional supplements, as well as hygiene and medical kits, will remain there "to reach Venezuelans in need in their own country as soon as that is safe and logistically possible," according to Elliott Abrams, U.S. Special Envoy for Venezuela. (Alex Brandon/AP) U.S. special envoy for Venezuela Elliott Abrams speaks during a media availability at the State Department in Washington, D.C., Feb. 7, 2019. But Maduro has blocked aid from entering the country for years. It's not likely he will relent, and it's unclear how the U.S., Guaido and partner countries like Colombia and Brazil, intend to get aid in. For now, it seems it will not be done forcefully. "I don't think that we or the Colombians or the Brazilians or anyone else is planning to try to force it in... We're hopeful that that, at least initial, decision on the part of Maduro can be turned around, if he sees real demand on the part of the people of Venezuela. Let it in! That's all we're asking - let it in!" Abrams said Thursday in Washington. The key to increasing the pressure on Maduro is the Venezuelan people themselves. 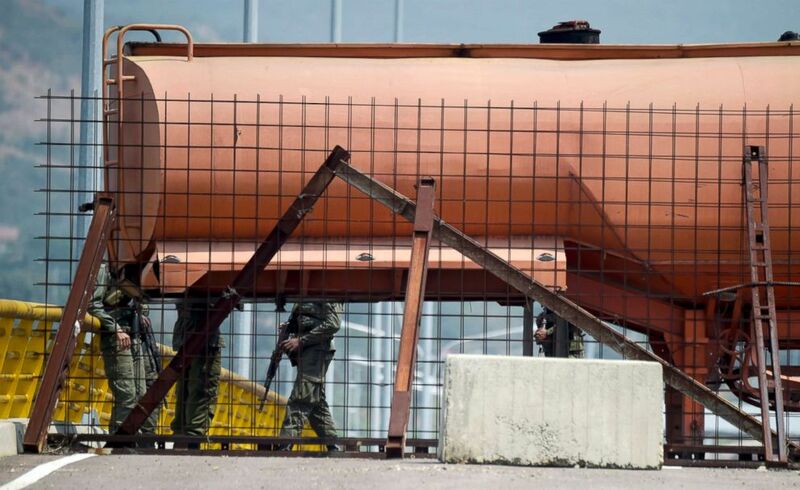 (Raul Arboleda/AFP/Getty Images) Venezuelan military forces stand guard as they block the Tienditas Bridge, which links Tachira, Venezuela, and Cucuta, Colombia, with containers, Feb. 6, 2019. "The truth, if they don't allow to go through, the people are going to come and they are going to take it away," one woman told the Associated Press in Cucuta. The U.S. is also hoping the armed forces will still abandon Maduro, even though there have not been major military defections in the two weeks since Guaido was sworn in as interim president by the opposition-controlled National Assembly. "Members of the Army are Venezuelan citizens. They have parents and children and brothers and sisters who are suffering badly, so our hope is that they will be able to persuade Maduro, or they will simply disobey orders to continue the starvation of the people of Venezuela," said Abrams. (Raul Arboleda/AFP/Getty Images) Trucks loaded with humanitarian aid for Venezuela drive to the Tienditas Bridge on the border between Cucuta, Colombia and Tachira, Venezuela, Feb. 7, 2019. To add to that pressure, the State Department also announced new visa restrictions and revocations for members of the Constituent Assembly -- the legislative body that Maduro created and filled in a sham election after he tried to dissolve the National Assembly. While Maduro is still hanging on and calling for dialogue, there was a major meeting in Uruguay on Thursday to test the waters for a democratic transition. A new international contact group, with members from European and Latin American countries, met in Montevideo, but the U.S. was not interested in joining, Abrams said. Instead, the administration has backed Guaido in his rejection of any talks with Maduro, saying it is simply a way for the socialist leader to buy time. "The time with dialogue for Maduro has long passed... The end game for him should be to leave power and the sooner, the better," Abrams said -- except to negotiate his departure. 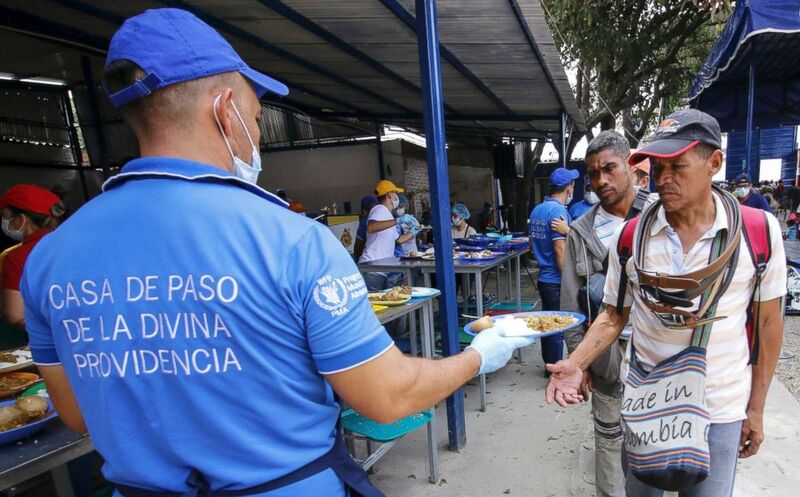 (Schneyder Mendoza/AFP/Getty Images) Venezuelan migrants are served a meal at the Divina Providencia migrant shelter in Cucuta, Colombia, on the border with Venezuela, Feb. 7, 2019. The only talks worth having are negotiating Maduro's departure, Abrams said, saying he could flee to "friends" like Cuba or Russia, while other members of the regime could go to other countries that have privately approached the U.S. saying they are willing to take them in, according to Abrams. He declined to say which countries those were. ABC News's Davi Merchan and Bruno Roeber reported from Cucuta and Conor Finnegan from Washington. ABC News's Ben Gittleson also contributed to this report.